How to delete history of VLC? IE History not getting deleted on Windows XP System. "Error: History delete failed." while clearing browsing history on Windows 7. Is it possible to delete Application History in Windows 8? Checking the history of Windows Explorer? How to retrieve the disappeared bookmarks in Sony laptop? Re: How to delete history of VLC? It is very easy to delete the history in VLC media player. 3. Then click on "Open Recent Media"
3.Now the play list history should be empty now. Some times we need to clear the History in VLC due to some Security Issues. You can do it simply with some Steps. 2) Click File and Select 'Open Recent'. Now your History of VLC will be Cleared. 3) click on clear ( then you have deleted the recent media list. Now the playlist history should be empty. Also to delete the indexed history of search menu, various players, recent documents, recently opened files ,recent videos from the computer use can use a very good software called CCleaner. This software allows you to clean all of these information that various softwares and Windows have in their memory. Use can select what stuff you want to delete or from which software you want to delete history.It is also useful in deleting cache memory of the web browsers. The software is available as a free download. Just google it on the net. Open VLC player from Start menu . After opening VLC player click on the Media option available on the top . Select that Open Recent Media option. After selecting that option you can find all the recently opened files. At the end of the list you can find a option as Clear. When you select that Clear option all the data will be cleared. Find the "recent media" in the dropdown list and click on it . In the popout list you should see a "clear" tab . This works on all versions of vlc. Good Luck . . .!! To erase the history of the menu of search, several players, the recent documents, recently open file, the recent videos of the use of computer can use a very comfortably placed software called CCleaner. This is the best software that think well the Internet. Open player of VLC of the menu begin. After opening the VLC player click on the option of available media in the soul. After clicking on the option it can find many options just as file open, open the folder etcetera.. It choose that it opens the option of recent media. After choosing that option that you can find that all recently opened files. at the end of the list it can find an option as clarify. When it choose that clears up the option all data will be cleared up. Now the play list history should be empty now. Easy right! I am giving you the pictorial description of this as how to do this task. 2) On the window of VLC player go to the Media icon. 3) From there go to recent media and select Clear. All the history will be cleared in your VLC. But since you will VLC every now and then and that too mostly for the recently used media files, clearing the history is not a good choice. It is very easy to delete the recent videos in VLC media player. 1)Open the VLC media player. 2)Click the 'Media" button->RecentMedia->Clear then all recent videos will be deleted. 3)some the recent videos will be displayed in recent folder in that go to recent folder and delete the recent videos. there is a option "program and feature" click on it . its open a dialog box unistall or change program. choose vlc program. n unstall it . other side if u want delet files of it go in c drive and delete it files. You can clear the recently opened media files in the VLC player by clicking on the media option menu on the top of the tool bar then you see the options of recently opened media and then if you select clear recently opened media then you can clearly check the media which is recently opened to delete.and also VLC is the user's friendly media player. 2.find the recent media in the dropdown list and click on it. 3. in the pop-out list you should see a clear tab. 2. click on file> open recent> click on "clear menu"
firstly run your VLC than in its media box click on media option and then select recent media and after selecting that click on clear after this the history of VLC player will get deleted. 1) Open VLC Player.2) Click on File and then Select 'Open Recent'.3) Select 'Clear Menu'. Just do that so History of VLC will be cleared. Its very easy to delete history in VLC. Open VLC player by double-clicking it. Click media->recent media at the top left corner of the vlc. Now the history will be displayed for you. You can delete the history now as you want. First open the VLC media player.In the top you can see file .There you can see the drop down thing.Just click on Open recent .There you can see clear menu.Thats it.The history is deleted now. It is very easy to delete history of VLC Media Player. You will have to do following things. Click Media, then choose Open Recent Media. A pop-up option will appear, then click on "Clear" option. After that, history of VLC Media Player will be deleted. This is a music and video player and now you are searching for how to delete the history on VLC player, then you don't worry you can delete by following instructions mention step by step and this is a very easy process. First of you need to start your VLC player. After that click on the file option. And after that you need to open recent. Now here you need to click on clear menu. Click Clear To Wipe Out All the History. Now click on file followed bu clicking on Open Recent. Now in the pop up that appears click on Clear Menu. 1.Firsrt "START" your "VLC" player. 2.Click on file->open recent->click on "Clear Menu". 3.Now the play list should be empty. Open the vlc player then look upto on the above toolbars . Click on " Media " and in it select " open recent media " . Then at the bottom Click on clear that will clear your vlc history . OR the easy way is Download CCleaner fro filehippo and run it it will automatically clear the vlc history . 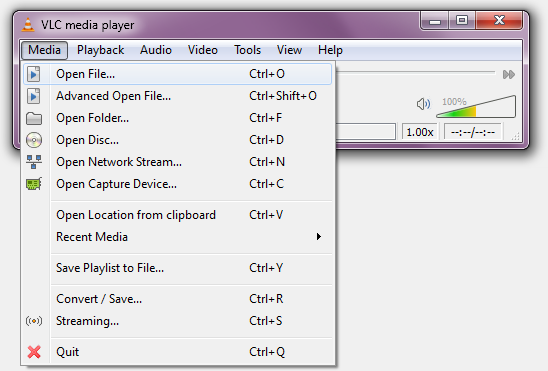 1) When u open VLC Media Player, There is a menu. Select "Media" option from that. 2) Choose the option "Recent Media"
3) Many files are shown which u already opened. Then at last there is option "clear". Click it. 4) That's it, you done very well......And when u see again that "Recent Media" option u will not find that stuffs (history files) again. You can download AML free registry cleaner from http://www.amltools.com/ . Click on Disk Cleaner button on left. In disk cleaner window, click recent files and click start. After that click delete selected. This will remove all your system history and shortcut files. All the methods like clearing recent history will not remove all the shortcuts from PC. When you follow any such method, just check in start menu whether recent files are visible. By AML registry cleaner method, even those recent files shown by vlc in start menu are also removed. my friend if you want to clear the history of your vlc player then it is very easy . 1. First of all you open VLC media player. 4. click on clear menu. Now history is got cleared. >>Then select the "Open Recent Media"
It should now not even save the history at all. >>Click on File-->Open Recent-->Click on "Clear Menu"
2)Click on file - GOTO - Open Recent- Click on Clear Menu. 3) Lastly you will observe that the playlist history is empty. Of Course, You can delete history of VLC. Please refer the below steps to delete history of VLC. Open VLC player from your Desktop Icon or Start menu. Select the Media option which is available on the top. Click on "Open Recent Media"
Finally you will find out that the play list history is empty. ==> Go to Media menu. This figure shows entire steps. ->Click on file->open Recent->click on "clear menu". ->Now the play list history should be empty now. This is the most common thing which you can do yourself. 3.select recent files in vlc player. 5.it will show the options. 6.double click on the delete option.